Mexico City has a street food scene that rivals the best in the world. The street food is so good that it sits in my Top 3 things I'll miss most about Mexico, just behind tropical fruits and the weather. This video by MC Luka is a delicious ode to Mexico's street food, and if you know Mexico City, you'll recognize some or most of the sites. I'll be referring back to this video often when I'm sitting at home in street food-less Madrid, wishing for a freshly-pressed, hot tortilla de masa just off the comal. 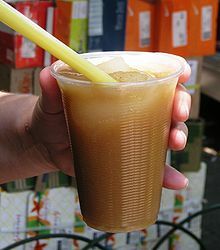 There's a drink mentioned called Tejuino that I've never tried because it's only found in certain states. Those of you in Jalisco and Guadalajara, what's Tejuino like? Recently, I saw someone on a travel show drinking it with a dollop of nieve de limón, to which the host described as tasting like a margarita. And, according to MC Luka, a great hangover drink, too? I don't lik tejuino much but my 4yr LOVES it. I guy comes by everyday around 1pm selling it. I don't like it mainly because it is kinda grainy. The taste isn't bad. Kinda salty. I have seen it sold with nieve also. Yeah tejuino isn't everyone's thing, but it's definitely good on a hot afternoon though, kind of like a michelada (depending on how it's made). I guess kind of like a michelada or pulque it's not quite what we're used to in a drink. Sweet but kind of salty, kind of grainy, kind of sour. It took me a while to really come around to tejuino; the nieve is pretty much essential.